We build stronger communities by investing and volunteering in support of sustainable housing initiatives and neighborhood revitalization efforts. We deliver industry leading community impact programs that advance neighborhoods, drive economic growth, and improve the communities we serve—while furthering our journey to rebuild trust. To accomplish this mission, we collaborate with established local and national nonprofit housing organizations that demonstrate the ability to create affordable and sustainable housing initiatives serving low- and moderate-income households, including seniors, veterans, and underserved families and individuals. We believe everyone deserves a healthy, safe, and affordable place to call home. Read more to find out if your organization is eligible. The Wells Fargo BuildsSM program provides financial support to eligible 501(c)(3) public nonprofit housing organizations when Wells Fargo team members help build, renovate, paint, or repair a home for low-to-moderate income households. To inquire about this program, reach out to a local Wells Fargo contact to determine if they are interested in putting together a volunteer team and applying for a Wells Fargo Builds grant. 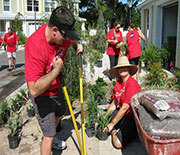 The Wells Fargo team member can complete an application if they have volunteers to assist in a build. The application must be completed and submitted by a Wells Fargo team member at least 45 days prior to volunteerism. While eligibility is a first step towards approval, it does not guarantee support. A high volume of funding requests comes through Wells Fargo Housing Philanthropy each year and we must prioritize these projects based on operational resources and community needs. Grant funding depends on the number of volunteer hours the local Wells Fargo team can contribute; the more they volunteer, the more dollars can be directed to the nonprofit organization. The application submission period is open from January 2nd until annual Wells Fargo Builds funding is fully committed. Our Homeownership Counseling Grant Program (HCGP) provides financial resources to local nonprofit housing organizations to create affordable and sustainable homeownership opportunities for low-to-moderate income (LMI) people. The grant program focuses exclusively on homebuyer counseling, homebuyer education, and foreclosure prevention activities. All grants are reviewed by a local Wells Fargo Housing Philanthropy charitable giving manager and committee for final funding decision. We provide grants for costs directly associated with programs or projects that qualify as an HCGP program segment. See program requirements and restrictions for more information on eligibility and requirements for our grant program. Eligible applicants must complete and submit an online application to be considered for funding. Those who submit applications during the HCGP submission periods will be notified in writing about funding decisions by the adjacent decision date. Incomplete proposals may delay the decision date. Applicants submitting proposals online will receive an immediate email confirmation that their application has been received. Should the submission-period end date fall on a weekend or holiday, the submission period will extend to the next business day after the original submission period end date. You can submit a new application or return to an existing application or review the Homeownership Counseling Grant Program Application Guide for screenshots and helpful hints to help complete your application. The RealtyWINSSM program is a suite of programs—including Good Neighbor Award, Volunteering Works Award, Local Good Neighbor Award, Realty Community Service Award, and Celebrate Giving Back — that extend our support of communities through partnerships with real estate associations. The Realty Community Service Award recognizes and honors real estate agents who are members of a diverse trade organization and who give back to their communities. Real estate agents who are members of AREAA, NAGLREP, NAHREP, NAREB, and VAREP may be nominated. All nominations are reviewed by a panel with representatives from each participating real estate trade organization and Wells Fargo. Grants will be awarded using a scorecard model based on a number of items, including: individual contribution (time and expense), tenure of contributions, and broadness of impact. Real estate agents from participating trade organizations will be invited to self-nominate or nominate others who meet the program criteria. Nominees should have contributed to a program that improves the livability of a local community. See program requirements and restrictions for more information on eligibility and requirements. Eligible nominations must complete and submit an online nomination survey to be considered. Those who submit nominations during the submission period will be notified in writing about nomination decisions by the adjacent decision date. Incomplete nominations may delay the decision date. Online nominations will receive an immediate email confirmation that their nomination has been received. Should the submission period end date fall on a weekend or holiday, the submission period will extend to the next business day after the original submission period end date. Our VeteranWINS® Grant Program provides financial resources to help invest, strengthen, and support sustainable military and veteran housing programs. Grant dollars may be utilized for new construction, capital improvement/ rehabilitation work, and supportive services projects that focus on neighborhood revitalization and stabilization efforts. Wells Fargo is committed to working with local nonprofits to provide solutions in support of efforts to address safe and secure housing for all veterans, specifically veterans at-risk of becoming homeless and/or homeless veterans. Read our VeteranWINS Frequently Asked Questions (PDF) for more information on eligibility and requirements for our grant program. You can submit a new application, return to an existing application, or review the VeteranWINS application guide for screenshots and helpful hints to help complete your application. If you are a nonprofit 501(c)(3) organization having difficulty accessing, inputting information, or submitting a VeteranWINS online application during an application submission period identified above, contact the CyberGrants support desk directly by sending an email to cgsupport@cybergrants.com. New applications can only be accessed and completed during the stated submission periods identified above. For information relative to the application, refer to the VeteranWINS application guide. Counselor-to-client assistance that addresses unique financial circumstances and housing issues, and focuses on overcoming specific obstacles to achieve housing goals such as: repairing credit, locating cash for a down payment, recognizing predatory lending practices, understanding fair lending and fair housing requirements, avoiding foreclosure, or resolving a financial crisis. Includes credit and budget counseling efforts. Education with an established curriculum and instructional goals, provided in a group or classroom setting or other formats (such as online), that covers such homeownership topics as the homebuying process, how to maintain a home, budgeting, the importance of good credit, and other homebuying related subjects. Pre-homebuyer education includes 4 to 8 hour workshops. Post-homebuyer education includes reverse-mortgage education efforts. Counseling efforts designed to help families keep homes that are facing foreclosure and stabilize the overall housing market. Provides information and assistance to avoid foreclosure. Efforts that focus on site preparation for, and construction of, entirely new structures and/or significant extensions to existing structures (specific to homes of LMI homeowners and homebuyers) whether or not the site was previously occupied. Efforts that focus on returning a residential structure (specific to homes of low- to moderate-income (LMI) homeowners/ homebuyers) to a state of utility, through repair or alteration. May include simple repairs or replacement of items such as a furnace or a ramp (for handicap accessibility). Efforts focused on the support of an individual(s) or the community to provide neighborhood stabilization and or revitalization through housing initiatives to support independent living, rental assistance programs, and other means of housing support to help ensure safe and secure neighborhoods and homes for veterans.